The accession of Henry II in 1154 brought about the beginning of the rule of the Plantagenet Dynasty. 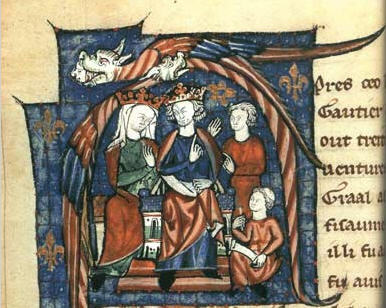 Henry II became king as a result of the settlement between Empress Matilda and King Stephen. With his Angevin lands, Henry’s Empire was vast, and powerful. His reign is often remembered for the murder of Archbishop Thomas Becket. However he oversaw changes in Government, Law, the Church and the economy. Henry’s latter years were marred by a Great Revolt, led by his son Richard and the King of France. Though he came out of the Revolt appearing much stronger, the tension remained and it was after a battle against forces led by his son, Richard, and the French, that he died, in 1189. Henry became actively engaged in politics at an early age. He participated in the campaigns of the civil war between his mother and King Stephen aged just 14. Aged 17 he was made Duke of Normandy. Anjou followed in 1151 when his father died. Shortly afterwards he was married to Eleanor of Aquitaine. She had just had her marriage to the French King annulled and the marriage created a union of several of the largest Duchy’s in France: a real threat to France. With his new found power, Henry led an expedition to England against King Stephen. This led to Stephen agreeing that Henry should become his heir. This and the death of Stephen’s eldest son, brought to an end the Anarchy. Stephen died in 1154 and Henry was crowned King Henry II of England. His lands became known as the Angevin Empire. He extended the territories under his control over the course of his reign, taking Brittany and expanding into Maine and Tourain. The most famous event of Henry’s reign was the Murder of Thomas Becket. Becket had been Henry’s friend and confidant. Appointed as Chancellor, Becket had shown great zeal in his administration. As an effective leader and administrator, Becket was the ideal person to take up the position of Archbishop of Canterbury when it became vacant. So Henry made his friend the Archbishop. Henry wanted a reform of the relationship between the Anglo-Norman church and the State. As a long standing friend and ally, it would be presumed that Thomas Becket would support Henry’s reform package: he didn’t though. Arguments over the rights of the church and the way that it should be administered continued throughout the 1160’s. Henry wanted the clergy to be accountable in his courts for any wrong doing. Becket fought to retain the rights of the church to maintain it’s own systems. The men of god were accountable to him, not the King. Becket left England at various points, for his own safety and to gain support. In 1170 the King was infuriated with his friends stubborn refusal to budge on matters. A group of knights went to Canterbury and killed Becket in the Cathedral, believing that they were acting upon the Kings wishes. Whatever the knights had heard the King saying, they had misinterpreted his meaning. Henry was shocked at Becket’s death. He paid public penitence at Canterbury and St Dunstan. Becket’s murderers fled to Scotland, then to Rome to seek absolution. The Pope ordered them to serve as Crusaders for no less than 14 years. Henry’s success as a military leader and the expansion of his empire began to cause him problems. As his sons grew up, they wanted greater influence. The question of inheritance began to be raised. Henry and Eleanor had 8 children. They all wanted to be powerful in their own right. Yet Henry was giving little away. His eldest son, Henry the Young, had a title but little say. Richard was persuaded that he may be overlooked in favour of John. john had won lands in Ireland but was believed to have ambitions elsewhere. Even the Queen, Eleanor, was seemingly unsatisfied. In 1173 the family feud over inheritance and influence spilled out into a Great Revolt. Henry had to raise an army to fight his own sons and wife. Henry won as he had a force led by men appointed on merit. The outcome did not satisfy everyone though. The young Henry revolted again in 1183 and was killed. In 1189 Philip of France persuaded Prince Richard that he would be overlooked in favour of John when Henry II died. The only way to secure his birthright was to take it. Richard rebelled and was supported by Philip. Henry II was defeated in battle. He died of a bleeding ulcer shortly afterwards. Henry II established a large Angevin Empire that made it’s rulers among the most powerful in Europe. He had great success in expanding this empire but less so in managing the expectations of his sons. He was succeeded by his son Richard I.